I’m joining in with Actually Mummy’s Wot So Funee? this week! I read Actually Mummy’s Funny Shopping List this morning, it reminded me of the times that Dave has come home with the wrong shopping and blamed my handwriting! Honestly! Everyone knows I always take the time to write neatly and legibly! Anyway, I thought I would share with you Rebecca’s linguistic accomplishments of the week. Rebecca is always writing. She loves to write stories and and illustrate them. She will ask me to “spell out” the words or she will find the word and copy it. She often turns them into books and they are lovely. But, I loved the writing that she did yesterday. I had been giving them the “back to school” lecture and reminding them that they had to actually get dressed this morning and would not be able to lounge about in pyjamas all day! 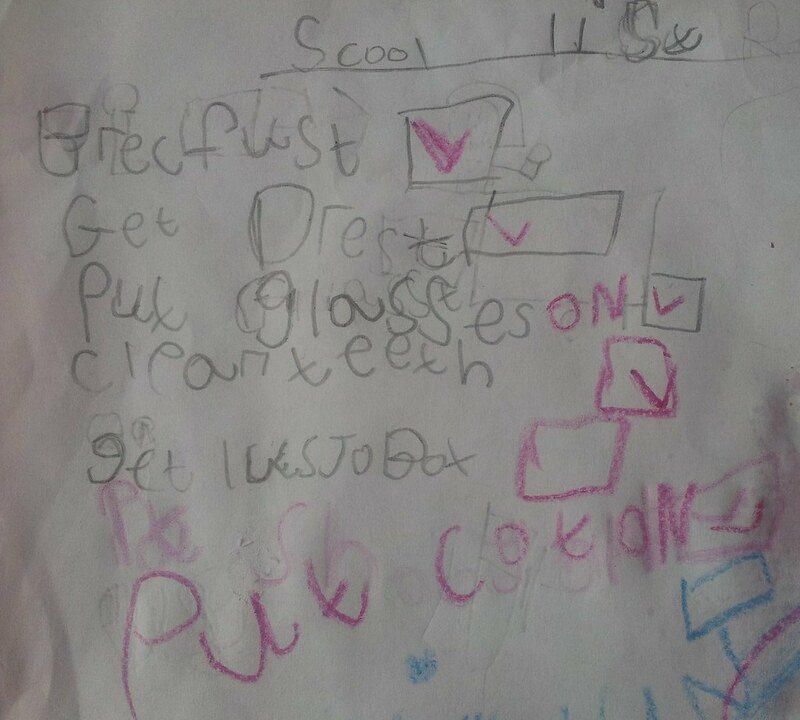 Rebecca looked worried and said that she did not think she would remember everything she had to do in the morning so she would make a list- I can’t think who she follows! So while I ran around finding uniform and swimming bags, she sat down and wrote her list. She was not very happy at first that I was not free to help her with spellings, but I reminded her who the list was for, and who would be the only one who would have to read it. She finished it, then she made a list for Danny and for Caitlyn. 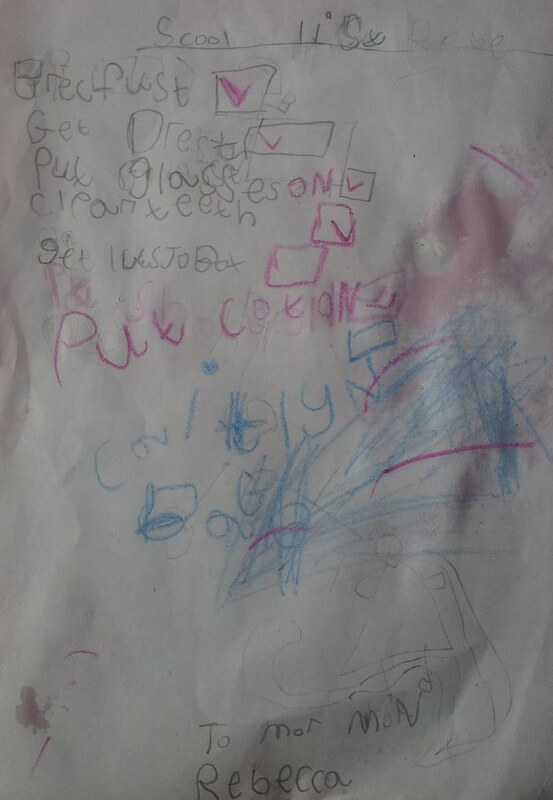 On their lists she omitted the “put glasses on” and added specific things that they needed to remember. She was “in flow”, and it was difficult to get her to leave the task to join us for tea, but she did when I promised her that she could finish off the lists before having her bath. I confess that I then forgot about them until this morning, I wondered why my kids each had a pencil crayon in their hands as they got ready? Of course! Their lists! Each time they did something on the list they ticked it off and then read off the next thing to do. It was so funny! But best of all they got every thing done without me having to shout orders like a Sergeant Major! They even remembered all the things that were not on the list- to have a wash, do hair and put shoes on (on the right feet!)! I’m not sure how she hears the word “lunch” to come up with that spelling! …that would certainly be funee! Oh I love it! What a sweetheart she is! Brilliant! Love the list idea! Oh, gorgeous! I can't wait until my little boy is writing notes. I'm terribly sentimental though, I might end up with boxes and boxes of notes. Do you keep any at all?